^ 1.0 1.1 Niagara-on-the-Lake, Ontario (Code 3526047) census profile. 2011年加拿大人口普查. Statistics Canada. [2012-02-24]. 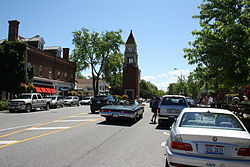 ^ Transit: Niagara-on-the-Lake. 滨湖尼亚加拉镇政府. [2013-08-11].